The LightRail 4.20 AdjustaDrive light mover moves two grow lamps along 13 feet of light mover rail. LightRail 4.20 AdjustaDrive light mover moves two indoor grow lights along 13 feet of light mover rail. This grow light mover is a beast. It’s worth saying first. And, the LightRail 4.20 AdjustaDrive light mover Kit is made for any sized indoor grow facility. So, whether we want to move two indoor grow lights or a hundred indoor grow lights, LightRail can do it. No matter the indoor growing system or space, the LightRail 4.20 AdjustaDrive light mover can fill it up and make it efficient. And, this is how that works for our grow light system. The LightRail 4.20 AdjustaDrive light mover moves two grow lamps along 13 feet (4 meters) of light mover rail. And, that’s inline, so end to end. So, that grow light system footprint would be perfect for a 4 foot or so width and a 13 foot length. And, that might be as wide as 5 feet with a more powerful grow lamp. And, if we want to go bigger and wider with our indoor growing system space, we can do this. We can go one row over for another light mover rail and repeat. So, now our indoor garden lights went from two grow lamps to four grow lamps. And, we are now using another LightRail 4.20 AdjustaDrive light mover, one row over. Also, our grow light system footprint went wider to about 8 feet or so, with a length of 13 feet. And, we get all this coverage using just two LightRail 4.20 grow light systems and four indoor grow lights. For a larger indoor grow system, we can go over another row. 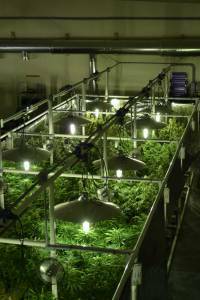 So, three LightRail 4.20 grow light systems moving a total of six grow lamps will cover a 12 foot to 15-foot width. And, that is still a 13’ length for our overall indoor growing system space with all three indoor growing kits parallel. Now, let’s double our indoor grow system space lengthwise. So, we could do an indoor grow system space of 12 foot to 15-foot width. And, it is now 26 feet long with six LightRail 4.20 indoor growing kits moving 12 indoor grow lights. As we can see, the LightRail 4.20 AdjustaDrive light mover is seriously versatile. And, it’s scalable so we can go as big as we want, and that’s row after row. And, we can go end to end to fill up any indoor grow system space. It makes indoor growing system space planning simple. What comes with the LightRail 4.20 AdjustaDrive light mover? This grow light mover comes with a LightRail 4.0 Motor with the 0-60 second-time delay. That feature provides even growth from end to end. Plus, the light mover Motor also has an adjustable speed of two to four feet per minute. It also comes with a 6 foot 6 inch (2-meter) light mover rail. Plus, it comes with an additional 6 foot 6 inch light mover rail. That second light mover rail makes the total length of 13 feet. Also included is the light mover trolley and the push/pull rod. Those are the Add A Lamp Kit components which move the second grow lamp. Also, the trolley wheels of both the light mover Motor and the auxiliary trolley, for moving the second grow lamp, come with pre-installed Extreme Duty Trolley Wheels. Those wheels are upgrades specific for these indoor growing kits. And, they make this grow light mover a serious work horse for any indoor grow system. For specifics, the Extreme Duty Trolley Wheels come with a lifetime warranty and are rated to sixty pounds. And, these wheels are also available to also upgrade any existing LightRail 3.5 or LightRail 4.0 Motors. Yes, you can buy a second Add A Lamp Kit to move a third grow light, again in-line. In that case, you would want to upgrade the trolley wheels to Extreme Duty Trolley Wheels so that they match the components of the LightRail 4.20 Kit. LightRail light movers all provide closer, better coverage. It’s all about grow lamp bravery and smart growers everywhere understand this very well. And, grow light movers let us be much more efficient in growth rates and yield numbers. We simply get more out of our indoor garden lights. So, yield increases significantly when our grow light systems move. And, while getting these results, we can cover about 30% more area, variable dependent. That makes LightRail light movers a serious efficiency product. And, with the LightRail 4.20 AdjustaDrive light mover, we can now more easily plan out our grow light systems. And, we can fill up any indoor grow system, no matter the size. Photo courtesy of Botany Unlimited, each hydro grow kit contains a LightRail light mover.